Pictured below are newly installed officers for Beta Alpha Chapter of The Delta Kappa Gamma for 2018-20. Front Row, from left: Cathy Greenleaf, Donna DeWitt, Josie Bapst, and Deborah Kerwood. Back Row, from left: Vickie Powell, Helenlu Morgan, and Debbie Rhodes. New members with their sponsors from left: Lisa Schwall sponsor for new member Marilyn Wills followed by new member Debbie North and her sponsor Debbie Rhodes. 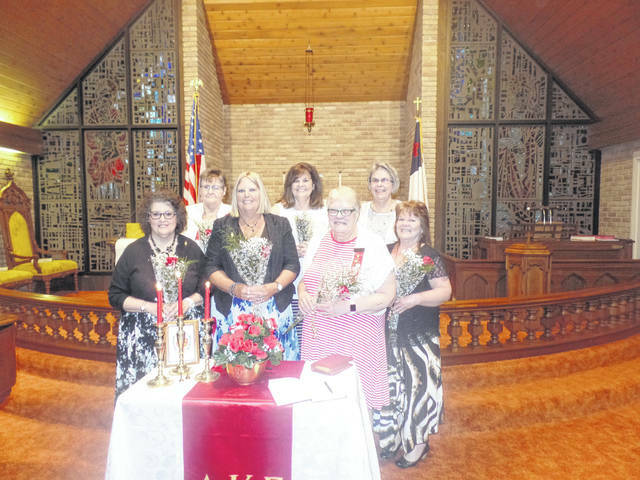 GALLIPOLIS — The local chapter of Delta Kappa Gamma recently met to induct new members and appoint new officers. 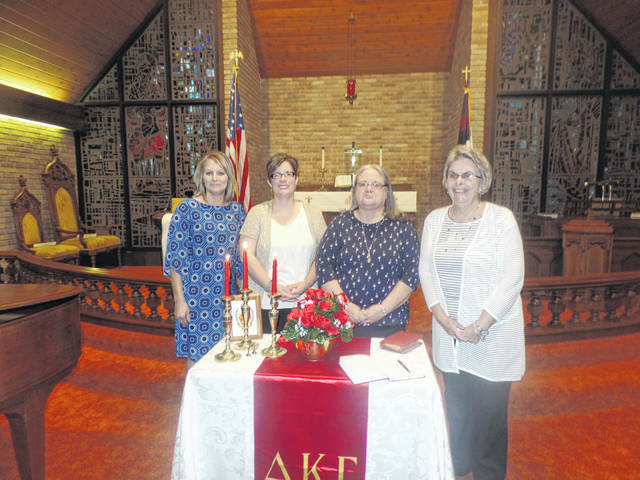 The Beta Alpha Chapter of The Delta Kappa Gamma (DKG) met on May 11 at Grace United Methodist Church. President Lynn Arnott welcomed everyone. Vickie Powell gave the blessing prior to a meal being served by the ladies of Grace United Church. First vice president, Cathy Greenleaf, thanked the ladies for the meal. President Arnott asked the membership to submit what months that members would be willing to serve as hostess or program chair/committee member; program ideas; ideas for guest speakers; meeting locations or caterers for next year. This information will help the members to prepare the schedule for next year at the June field trip/planning meeting. Donna DeWitt requested that members also note any email address changes. Either DeWitt or Deborah Kerwood send information to members through email. However, it is the responsibility of each member to keep their email address current in order to receive the information. Helenlu Morgan gave the treasurer’s report. A pin order will be going in soon. If you would like to order a pin, please contact Morgan soon. Kerwood gave the secretary’s report for March and April. Arnott and Greenleaf reported on their recent attendance at the Phi Delta Kappa April Convention in Columbus. They noted some suggested changes that will be voted on in August. DeWitt provided information on the June 14 field trip/planning meeting at 11 at Ravenwood Castle in McArthur. A carpool will be leaving the back parking lot of Vinton Elementary at 10 that morning. R.S.V.P. to DeWitt by June 7 at 740-853-you’re your reservation along with your meal selection. Door prizes were given prior to a necrology ceremony conducted by Vickie Powell in remembrance of Marjorie Payne. This was followed by the installation of new members, Debbie North and Marilyn Wills . Officers for 2018-20 were installed as follows: President – Cathy Greenleaf; First Vice President – Donna DeWitt; Second Vice President – Josie Bapst; Recording Secretary – Deborah Kerwood; Corresponding Secretary – Vickie Powell; Treasurer – Helenlu Morgan; Historian – Doris Lanham; Parliamentarian – Dorothy Ruff. The meeting was concluded by the singing of the Delta Kappa Gamma song. The Delta Kappa Gamma is an international association comprised of women educators whose purpose it is to promote women in education.